Assemblers and Fabricators (Median Wage of $10.81/hr) assemble finished products and the parts that go into them. 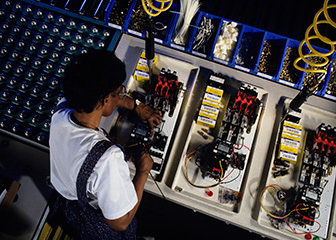 They use tools, machines, and their hands to make engines, computers, aircraft, ships, boats, toys, electronic devices, control panels, and more. Sample job titles and technology skills unavailable for 51-2099 Assemblers and Fabricators, All Other. Team Assemblers (Median Wage of $13.25/hr) work as part of a team having responsibility for assembling an entire product or component of a product. They can perform all tasks conducted by the team in the assembly process and rotate through all or most of them rather than being assigned to a specific task on a permanent basis. May participate in making management decisions affecting the work. They include team leaders who work as part of the team.